Attention: the skies, the soil, and the waters are being poisoned from above, and we are bringing you the leading authority on this “geoengineering” disaster: powerhouse researcher and educator Dane Wigington. Who in the world (or from off it) is behind this? What is the long-range agenda? Why are “they” destroying the very ecology that we ALL need to survive? Why are soils acidifying for no apparent reason? Why are animals vacating significant tracts of land for no reason connected to nature? Why are “we” microwaving parts of the ionosphere? What are the effects of the above actions? Will we wake up in time to stop this madness? Dane Wigington hopes so and he is here to set the record straight. Dane has a background in solar energy. He is a former employee of Bechtel Power Corporation (yes, that Bechtel) and has a background in renewable energy. His personal residence was featured in a cover article on the world’s largest renewable energy magazine, Home Power, and he owns a large “wildlife preserve” next to Lake Shasta in northern California. Dane put all his focus, efforts and energy on the geoengineering issue when he began to lose very significant amounts of solar uptake due to the ever-increasing “solar obscuration” caused from jet aircraft spraying in the skies above his forest home. He also noted significant decline in forest health was occurring and appeared to be accelerating. Extensive testing and research into the geoengineering issue was commenced and has continued since 2002 – with VERY disturbing results. Dane is the lead researcher for www.geoengineeringwatch.org and has investigated all levels of geo engineering from stratospheric aerosol geoengineering (SAG) to HAARP. He has appeared numerous films, and radio interviews to educate the public on the extremely dire environmental and health dangers we face on a global level from geoengineering. Please tune in this Sunday at 9 pm Sydney time and share this crucial information about geoengineering far and wide! Weather as a Force Multiplier: Owning the Weather in 2025 – a US Air Force document, download here. Approaching People on the topic of Geoengineering – First of all, semantics are extremely important in regard to the introduction of geoengineering. The geoengineering term is related to hard science, the “chemtrails” term has no such verifiable basis but rather leads anyone that Googles the term straight to “conspiracy theory” and “hoax” definitions. Use the terms “climate engineering” and “geoengineering”. More details here. An introductory letter about geoengineering – Send to anyone you’d like to inform about geoengineering: your friends, your family, your local/state/federal politicians, your social media followers, anyone you feel will listen. Read the letter here. Read Marvin Herndon’s Public Notice regarding the retraction here. Spray Jets on aircraft – Evidence of aircraft spraying whilst flying in the air. HAARP Data – Information about what Dane Wigington believes is being done in HAARP stations around the world. I propose that a series of ground based stations , using a HAARP type technology (i.e. a ground based station that emits a high frequency or low frequency).. is being used to produce pulses which we see appear on RADAR for a short time. It would appear this high frequency electromagnetic pulse is done to “heat” the atmosphere above each station …. possibly to create an “artificial ionospheric mirror = AIM” WITHIN THE ATMOSPHERE, maybe to have some other yet unknown effect OTHER than weather modification, or these pulses could quite possibly be done for the sole purpose of engineering the weather. The “goal” of these frequency flashes has not yet been determined. Geoengineering, A Clear And Present Danger – This video presentation by Dane Wigington was done in Northern California on November 21st, 2014. It is a wake-up call. When the ship is going down, one must prioritise their time, their actions, and their energy. The planet is dying. Though there are countless forms of damage to Earth from human activities, climate engineering is mathematically the greatest single source, it is the epitome of human insanity. Our society has been very well trained to turn two blind eyes to the big picture, and to simply spend their time and energies only on their own pursuit of personal pleasures. If this paradigm is not overturned, and people do not choose to stand and face the challenges closing in on us, we will have no chance. Now is when we decide why we are here. Now is when we decide what it means to show our love for our children. If life on Earth is to have any possibility of survival, if our children are to have any chance of a future, we must all stand together in the battle to preserve what life is left on our once thriving planet. If we do not act today, we will not have tomorrow. Geoengineering Earth, Exposing The Global Climate Modification Assault – Governments around the world have long since fully deployed global climate engineering on a scale that cannot truly be comprehended. They decided (without public knowledge or consent) that they had the right to use the atmosphere of our planet to serve their own agendas which amount to nothing less than weather and biological warfare. On August 14th, 2015, there was a major event in Northern California that was organized for the purpose of exposing and halting the global climate engineering programs that are decimating our planet and the entire web of life. Numerous experts spoke out at this event including attorneys, former government scientists, a former defense industry technician, former military personnel, a prominent Northern California Neurologist, and a CEO for one of the largest environmental and engineering consulting firms in the world. Approximately 1000 people attended this event. The video below is the primary PowerPoint informational presentation given at the event, “Engineering Earth, Exposing The Global Climate Modification Assault”. This presentation was given by Dane Wigington, lead researcher for geoengineeringwatch.org. 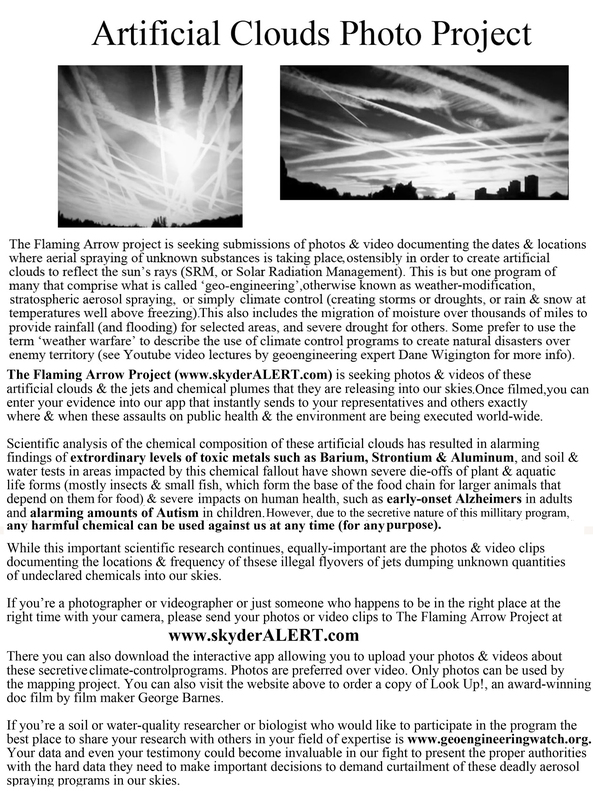 Flyers about geoengineering that you can print and share with everyone you know: Click on any flyer below to download high-resolution PDF file for free. Thank you for listening to Troubled Skies: The Environmental And Health Dangers Of Geoengineering With Dane Wigington. Please share with your friends below. If you enjoy listening to episodes of GFM Media and are financially able, we ask that you please consider tossing a coin or two in our Tip Jar to help keep GFM Media on air. Thank you! October 14, 2015 | Filed Under: Are we killing the planet?, Are you really free?, Chemtrails / Geo-engineering, Conspiracy, Environment, Featured, Global Freedom Movement Media, Science, What is the healthiest way to live?, Who rules the world?